Sir Albert Wickes and The Right Honourable Clarence Baxter. Such odd names for this dynamic duo, one which is making their way to Mars as I write this. In the 19th century. What do you mean ‘we’re not in the 19th century anymore’? 39 Days to Mars is a video game. Kick back and enjoy the trippy, nonsensical, co-operative experience instead of nitpicking. That said, while I’d love to claim that our two protagonists are the brightest minds ever to grace the skies… they aren’t. Almost the exact opposite, actually, which makes them perfect for a game like this. One in which, if something can go wrong, you better believe it will. Time and time again. So why are they ‘perfect’ if they’re that incompetent? Well, isn’t it more fun to have a chaotic journey than one in which everything’s just – in a manner of speaking – smooth sailing? I think so anyway. It does also have the added bonus of forcing cooperation between the two players (or one player and… the ship’s computer-controlled cat), as nothing can be done without efforts from both. Nothing. Tea spilled? Takes two to clean. Map shredded by a certain cat? Takes two to put it back together. Ship exploding? Takes two to… oh. Well. Anyway, you get the idea: everything aboard the HMS Fearful (lovely choice of name) is a team effort! Ain’t a long journey either, as it “fits comfortably into an evening”. Too short? Ha! Say that again after you’re done yelling at your teammate for not helping. Yeah. 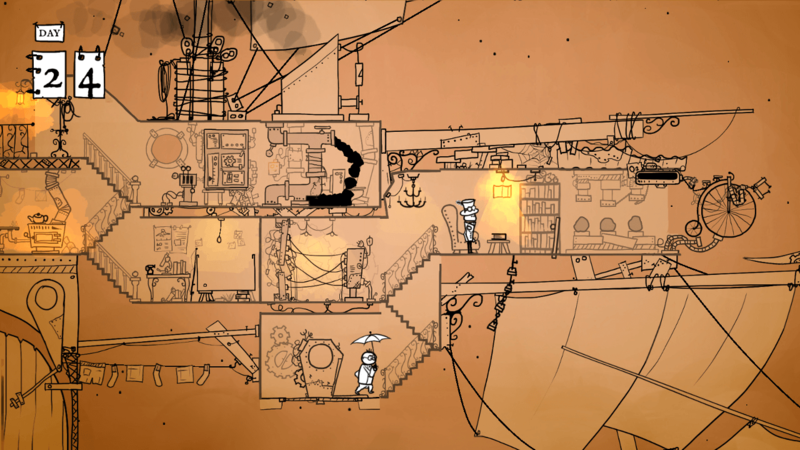 39 Days to Mars is available on Steam, itch.io and Humble Store, carrying a $14.99 price tag.